As a waitress and middle-aged divorcee, owl shifter Pauline has given up on her dreams of being a mother. But secretly, in the quiet depths of her heart, she still yearns for a family. So when her estranged cousin goes missing, she’s not about to turn her back on the three children left behind, even if they resist her efforts to help. 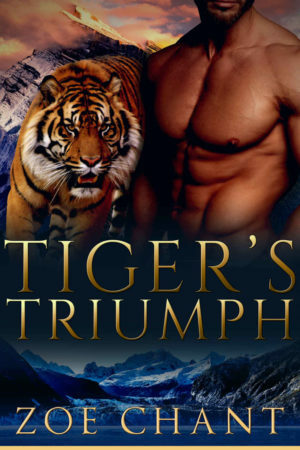 Tiger shifter Carlos has the ideal life—at least on the outside. After serving in the Marines, he went into the business world and made a fortune, enough to retire young and do whatever he pleases. But he’s starting to realize that money isn’t everything. The price of success was lonely luxury in the city, but he’d rather have a family to love and a forest to run in. When Carlos travels to Glacier Park in search of the elusive ‘something more,’ he finds it unexpectedly in the eyes of a beautiful, determined waitress. He and Pauline are shocked by an intense connection they never thought they’d experience. But happily ever afters have to wait, as danger threatens her cousin’s children, and enemies from the past resurface with grudges to settle. Can all of them work together to win the day and build themselves a new family? Tiger’s Triumph is a thrilling and heartwarming interracial romance featuring cute kids, gorgeous vistas, and a lot of sizzling passion. No cliffhangers!